When snow and wintery weather turn the city into a sparkling white paradise, chase away the cold by ice skating. 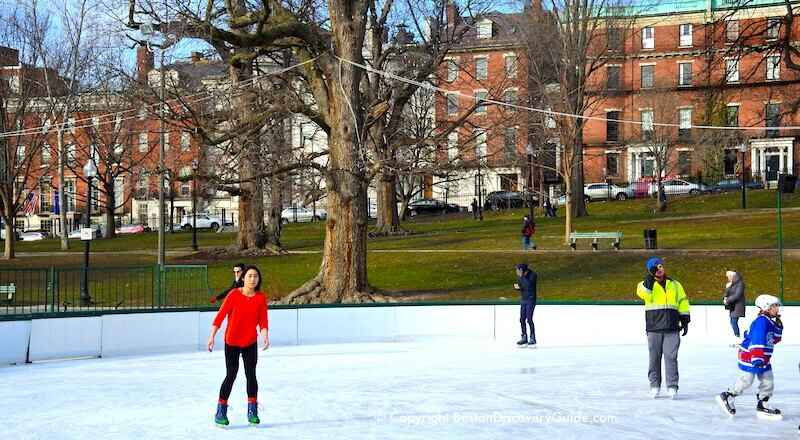 Boston offers excellent public rinks including the famous Frog Pond rink on Boston Common and an "Insider Secret" rink in the North End. You can find a couple more in Cambridge. Boston ice skating brings out crowds who love this winter activity. On warmer days, refrigeration under the ice and surface-smoothing zambonis keep the skaters happy. 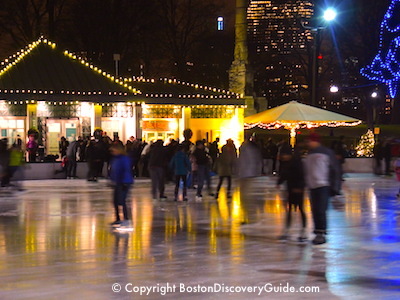 If you're visiting Boston, no need to pack your skates - rinks offer rentals for a small fee. Get ready to love winter in Boston! From mid-November through mid-March, Frog Pond (no longer an actual pond but instead, a shallow concrete-lined pool with a depth of about 6 inches) transforms into a magical expanse of ice in the middle of the city. 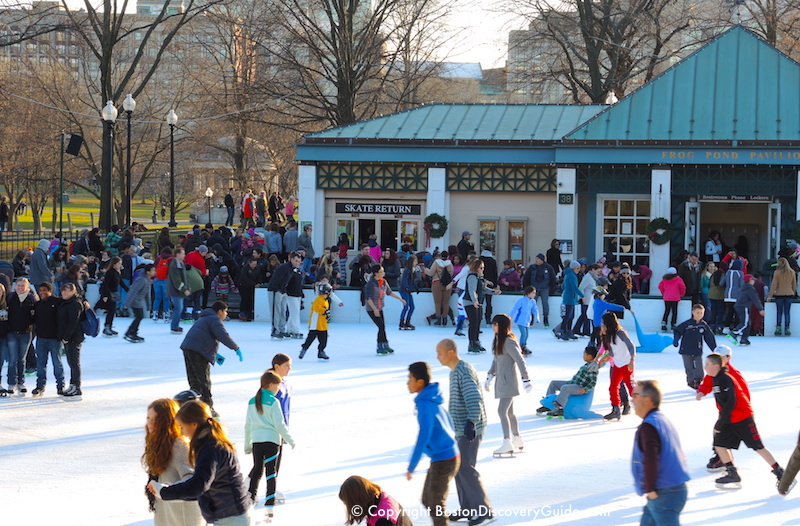 Conveniently located in Boston Common right in the center of the city, the rink is an easy walk from most Downtown, Back Bay, and Beacon Hill hotels. Boston Common's Ice Rink at Frog Pond - Look closely and you can see a couple of people using "Bobby Seals"
With picturesque Beacon Hill in the background, skating on Frog Pond is one of the things that makes so Boston terrific in the winter. Take a spin on the ice right in the middle of Boston Common. Bring your own skates, or rent them at the rink for a reasonable fee. Frog Pond does get fairly crowded at times - especially on sunny weekend afternoons. By contrast, Boston school holidays typically draw fewer crowds than you might expect, as a lot of Bostonians leave the city to go skiing. 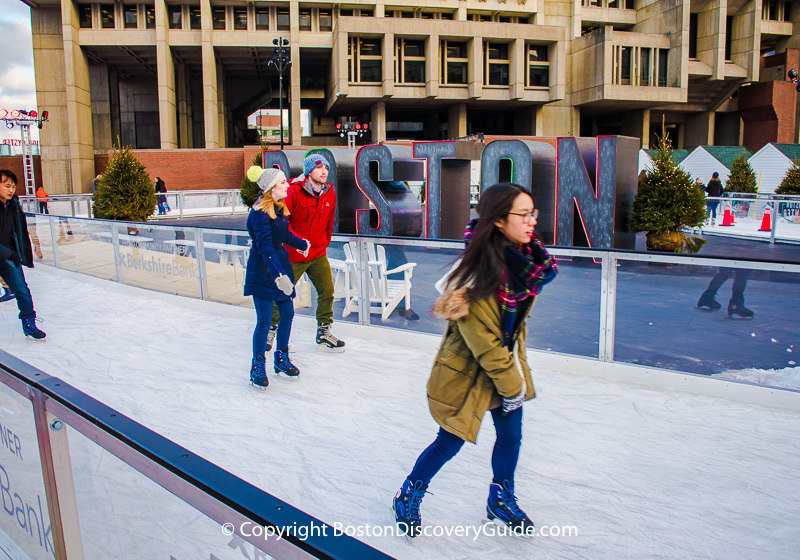 The Steriti Ice Rink in Boston's North End is sort of an Insider's Secret: It's an easy walk from North Station, it's open from late November until mid-March, and skating is free! The catch? The Steriti is heavily used by ice skating by Boston and North End teams and has limited public skating hours - usually a couple to a few hours daily. But hey, it's free. If the hours happen to work with your schedule, you'll love the frendly vibe at this large, well-maintained rink, one of the 41 rinks throughout the state overseen by the Massachusetts Department of Conservation and Recreation (DCR). Steriti Rink's indoor location offers a big advantage when outdoor conditions aren't perfect for ice skating. Spectacular waterfront views across to Charlestown and East Boston. You'll find Kendall Square Community Skating in East Cambridge, just across the Charles River from Boston, in a bustling neighborhood loaded with hotels, restaurants, businesses, and retail space. The seasonal outdoor rink is only a block from the edge of the campus of Cambridge's renowned MIT (Massachusetts Institute of Technology) - so if you're at MIT for an interview or campus tour during the winter, stop by for some stress-relieving ice skating. Boston is only 5 minutes away by T.
Cost: Adults $5; seniors (65+) and students (K-12, college students with ID) $3; children 10 and under $1. Season passes also available. Other amenities: Locker rental for $1; skate sharpening for $7; skating school offering lessons to all ages. Nearest T station: Red Line/Kendall-MIT. When you get off the T, walk through the Marriott lobby, exit onto Broadway and turn right. The first intersection is Third Street (you'll see a big globe). Turn left onto Third, walk 3 blocks to Athenaeum, and turn right. The rink is one block away, on your left. Tip: If the weather isn't good (sleet, rain, strong wind, heavy snow, too-warm temperature), check the website to make sure the rink is open. PLEASE NOTE: Construction at City Hall Plaza has shut down this popular event this year - so check out the other skating venues instead. We're leaving the information up so that you can plan ahead for next year! A first for Boston and New England: a custom-designed outdoor skating path around City Hall Plaza. Also sharing the space through mid-January will be a European-style Winter Holiday Market featuring 85 chalets with vendors and artisans, with over half of them being local vendors such as Boston Olive Oil Company, Yankee Lobster Company, and Etsy Artists of Boston. Look for Santa's Cottage, a sparkling holiday tree, and special events. For refreshments, stop by Vinopolis, where you'll find hot drinks, beer, wine, and snacks. Nearest T station: Green and Blue Lines/Government Center; Haymarket (Orange Line) is across the street. 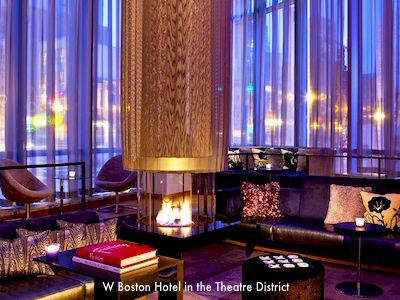 Choose a hotel near City Hall Plaza (and TD Garden), and enjoy low winter rates. PLEASE NOTE: The ice rink will not be up this year. Look for Boston Harbor Hotel's seasonal ice skating rink right under the hotel's iconic arch, giving skaters spectacular views of the waterfront as they spin around the ice. Enjoy the hotel's wonderful location next to the waterfront and the Rose Kennedy Greenway - plus close to Boston's historic and modern attractions! Take advantage of being close to BHH's skating rink - and enjoy low winter rates on the Waterfront. 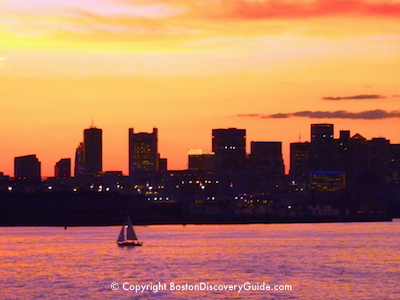 Enjoy the views plus all of the fun activities along Boston's waterfront when you stay at the Boston Harbor Hotel. Note: Although we do our best to keep cost information on this page up to date, costs may (and do) change at any time, so please consider the costs on this page as approximate rather than as exact. 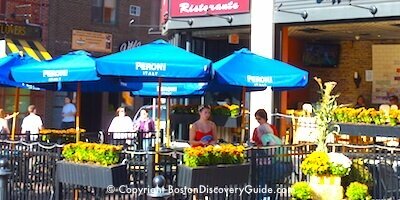 Want to know the best tours for seeing & exploring Boston in the winter?